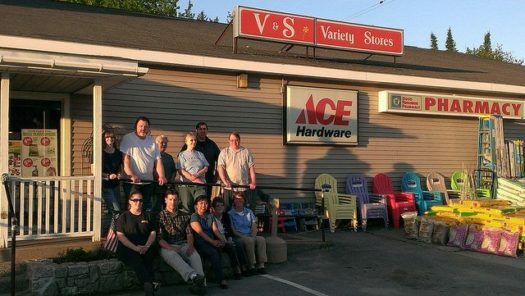 “A hardware store in Maine.” Credit: U.S. Department of Agriculture. In North Carolina, The Industrial Commons is pushing for existing businesses where owners are seeking to sell to give themselves over to cooperative worker ownership. Readers may recall any number of stories we’ve published about such efforts around the country. Franzi Charen, who helped found the Morganton-based nonprofit, says, “More people are retiring than ever before,” which presents both a crisis and an opportunity for the local economy. Charen’s father has been trying to sell his business for seven years. But, as she learned through a BizBuySell survey, only 20 percent of businesses listed for sale actually sell. “One of my concerns is losing these businesses to outside interests,” Charen says pointing to a need for succession planning to maintain local economic interests. In March, Xpress reported 45 percent of all local businesses with paid employees in Buncombe County are owned by someone age 55 or older. And while owning a small business may seem overwhelming to an individual, worker ownership spreads the work, the investment, and the proceeds, and Charen believes it can succeed across almost all industries. Services offered by the nonprofit start with a two-part feasibility study of whether there’s sufficient financial capacity and “human capacity” for employee ownership. After that, it helps gauge the match between the owners and the potential worker-owners while providing a framework for how the sale will be structured and financed, and how the new business will be managed. Watching collaboration around the development of a local arts group evolve is wonderful. But sometimes, as time goes on, the whole endeavor becomes victim to misaligned understandings.